The story begins at a happy reunion of the McClare family, Caitlyn McClare, matriarch to this clan; cousin Cassie McClare McKenna and her new husband, Jamie; Alli McClare and her fiancé Nick; Uncle Logan McClare, once engaged to Caitlyn and still in love with each other – secretly; Blake McClare, still single; seven year old Maddie McClare; Bram Hughes; and of course their housekeeper Rosie O’Brien and Hadley, the butler who is nearly deaf and blind. Not to forget Miss Behave – the family parrot. Julie Lessman is true to her excellence in constructing a story, leaving one breathless as she ends almost every chapter with a question. Ms. Lessman has a knack for creating page turners – consolidating several stories – each with a conclusion, some predictable – most all surprising! However, be aware for explosions and mysteries to happen throughout. You may think you can predict what might happen, but do not be too quick to assume anything where Julie Lessman’s writing is concerned. Meg’s mother Caitlyn has arranged for Meg to be an intern for District Attorney Andrew Turner, who just happens to be Logan’s worst enemy, ex-best friend. To complicate matters, Andrew is in love with Caitlyn and pursues a courtship with her. And then – lo and behold – Devin Caldwell is also a summer intern for DA Turner and does not recognize Meg – until she prompts his mind. Devin falls in love with Meg and they become close. Meg cannot forget Bram and feels rejected. Meg’s kindness helps turn Secretary Bonnie Roof from a weed into a flower so that George, the executive assistant DA would notice her. One of Meg’s better qualities was her interest in bettering life for everyone. All of the above led to heartache, romance, mystery, humor and exhilaration – even dirty politics melds into this story to thwart Caitlyn and Meg’s plans to wipe out the horrible plight of women and girls ensnared in the brothels of the Barbary Coast. Hopefully you have read the first two books in this series. 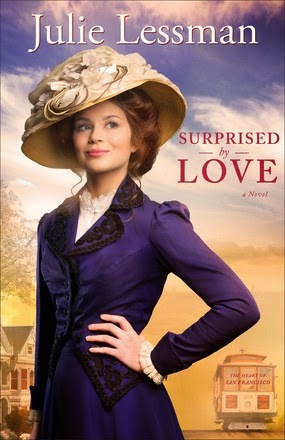 You might better understand this tale – however “Surprised by Love” is easily a stand-alone story. There is much more activity to entertain you including Jamie’s mother and sister’s story from a preceding book. Believe me, you will never be bored! Bram’s mature faith in God spoke to me time and again. He mentored Logan into praying and believing. You will not be able to hold your tears while he describes how he feels trapped into marrying Amelia Darlington to help his father’s business survive. Bram’s guilty conscience over his involvement in hurting his father’s health and sight is well hidden – but just another reason why he cannot entertain the idea of being in love with Meg. Julie Lessman’s own faith in God is so apparent in the prose and scripture that fill this novel with the beauty and splendor of God’s intervention with the characters. Ms. Lessman has a proverbial pen that does not disappoint. Hello … I’m Julie Lessman, an Inspirational Romance author with a passion for God and a passion for romance. Since the age of twelve, I’ve been in love with the idea of being “in love.” It happened the moment Scarlett seared Rhett with a look on the winding staircase of Twelve Oaks. Suddenly I was a goner, spellbound by the emotional ebb and flow of romantic relationships. As an adult, I quickly learned that true romance is spiritual as well as physical and emotional. And one pass through the “Song of Solomon” in the Bible told me that God was the biggest romantic of them all, deeply passionate in His love for each of us. Through my love affair with Him, I have discovered that romance can transcend to another dimension where romantic passion and spiritual passion merge, creating a 3-D love story: the hero, the heroine, and the God that brings them together. I hope you enjoy my stories … and may they bring you closer to the Father’s heart. Chosen as the #1 Romance Fiction Author of the Year in the Family Fiction magazine 2012 and 2011 Readers Choice Awards, Julie was also awarded #1 Historical Fiction Author of the Year in that same poll and #3 Author of the Year, #4 Novel of the Year and #3 Series of the year. 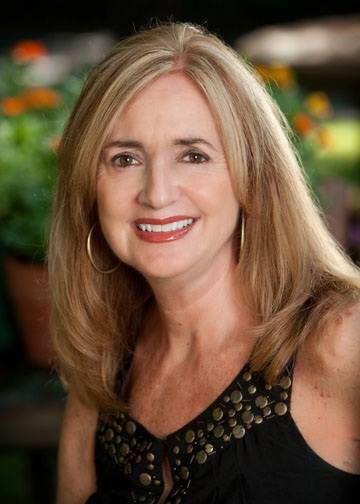 She resides in Missouri with her husband, daughter, son, daughter-in-law and granddaughter and is the author of “The Daughters of Boston” series—A Passion Most Pure, A Passion Redeemed, and A Passion Denied. Book 1 in her “Winds of Change” series A Hope Undaunted ranked #5 on Booklist’s Top 10 Inspirational Fiction for 2010. You can connect with Julie on her website, blog, Facebook, Twitter, and Pinterest.